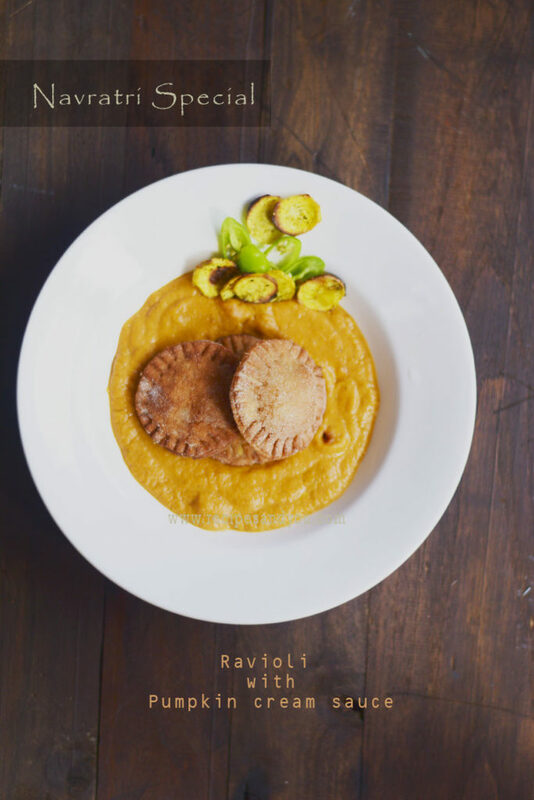 Ravioli -A Navratri Fasting Recipe – Ravioli with Pumpkin cream sauce Gluten Free and egg free recipe | Navratri Recipe| Gluten free |Egg Free recipe served with baked sweet potato chips. No onion No garlic recipe. 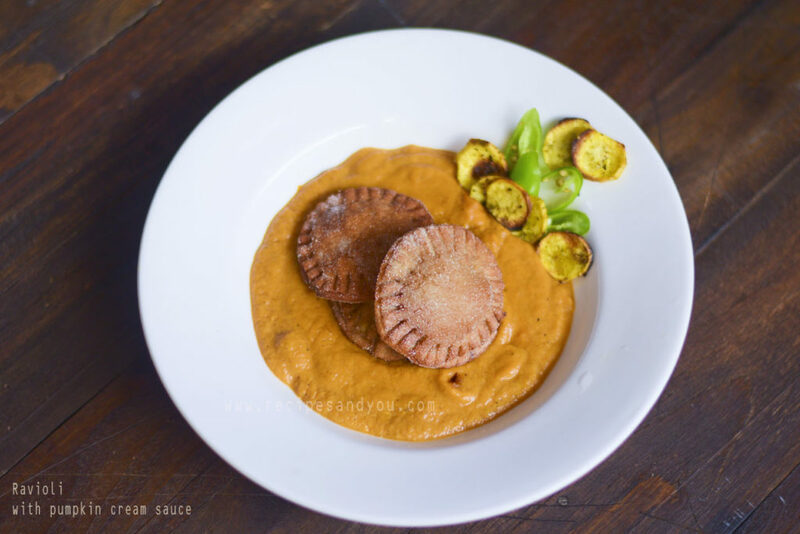 Ravioli -A Navratri Fasting recipe made with Amaranth and samak rice flour fried and served with pumpkin cream sauce and baked sweet potato chips. Enjoy fasting with this amazing Indo-Italian delicacy. Make fasting enjoyable with a twist of flavors and breaking out from the good old traditional ways of cooking. I love the traditional recipes made during fasting,but occasionally i wish to change the mood and have something different and new on my palette. I wish i could have a twist of flavors and try something new. 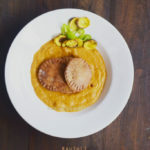 These ravioli- A navratri fasting recipeis made with Amaranth flour and samak rice flour .I have made these with potato filling, but you can make these with cottage cheese filling, just peanut and dry fruits filling or any other filling of your choice.If prefer hotter then you may add the number of green chili. This is a fasting special recipe but you may make it otherwise with an onion filling too for a party or dinner. These raviolis are deep fried.But if you prefer you can pan fry them with less oil . 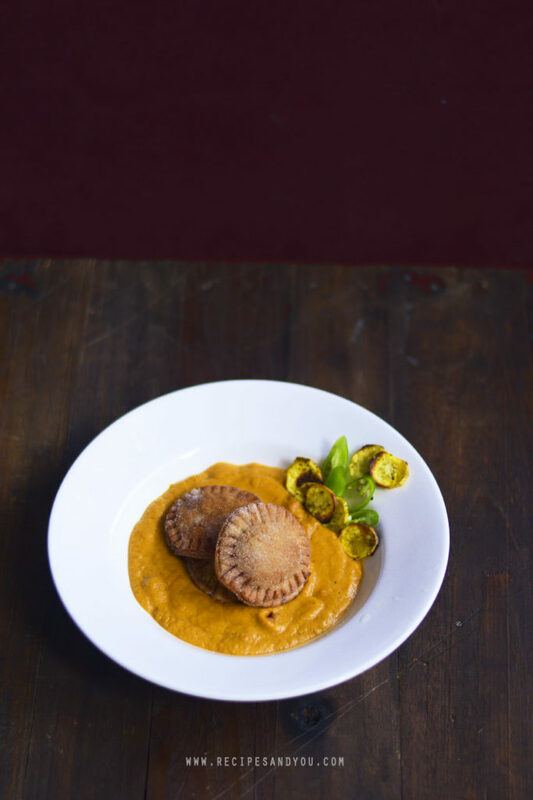 Ravioli made with Amaranth and samak rice flour fried and served with pumkin cream sauce and baked sweet potato chips. Enjoy fasting with this amazing indo-italian delicacy. Mix the amaranth flour and samak rice flour and add salt to it. Add the ¼ cup warm water slowly and knead firm dough. Don’t add the whole water at once. Cover the dough and keep aside for 5-10 minutes. Here if you wish it a bit hot then you may add chopped green chilies but it’s completely optional. I did not add as the sauce too has green chilies. Mix well and keep aside. Other filling options are: cottage cheese, dry fruits, if not making for fasting then you may have a masala onions filling . Deskin and chop the pumpkin. Heat 1 tsp. ghee/clarified butter/oil in a pan and add the pumpkin. Saute on medium high flame and add a pinch of salt. Saute till a bit soft and slightly brown on all sides. Remember to keep stirring to avoid burning. Keep aside. Now, in the same pan, add 1 green chili slit lengthwise, roughly chopped tomatoes, few black peppercorns and chopped ginger. Saute till the tomatoes turn slightly brown. They should look like grilled. Transfer them to the mixer jar and grind to puree with 1 tbsp. water. Sieve the puree and keep aside. In the same pan, add 1 tbsp. oil/ghee and add the pumpkin puree. Add salt and pepper powder. Let it simmer for 1 minute and then add the pureed tomatoes. Let it cook for 5 minutes and add the Sugar. Cook till it is well incorporated or you see a bit of oil separated on top. Add a bit of water for consistency. Then add the cream and mix well. Cook till one boil and transfer to the serving dish. Making Raviolis: Sprinkle some samak rice flour on the shelf. Roll the ravioli dough with a rolling pin. Roll as thick as a roti/chapati. Take a cookie cutter. You may take a round or square cookie cutter.Cut pieces with the cookie cutter. Now take one round and put the filling in the center of the ravioli. Cover it with another roundel. Like this make all the raviolis from the rolled dough. With a fork, seal the edges making a slight mark on the edges. Now, Heat oil in a saucepan and once the oil is hot, start frying the raviolis. Oh wow! I love ravioli in pumpkin sauce, especially during this time of year. Homemade ravioli puts it over the top and this recipe looks so so delicious! Dominique they are also special as they are made of Amaranth flour which is gluten free. So one point up on the health quotient.Glad you liked.Thanks.